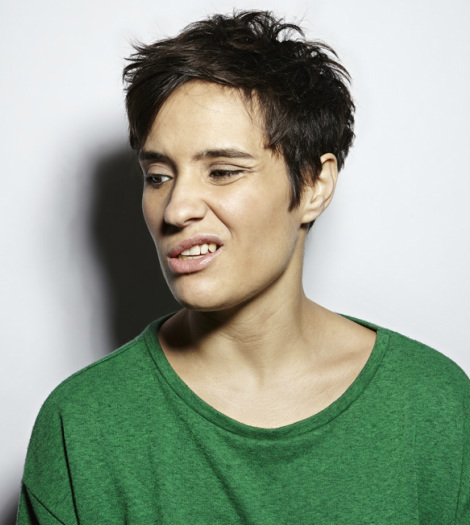 Jen Brister has firmly established herself on the UK stand up circuit. She has appeared at the Edinburgh Festival Fringe and has had a stint as a BBC Radio 6 presenter. In this exclusive interview with RUComingOut, Jen talks about comedy, the closet and her own coming out experience. Do you think it's hard for LGBT entertainers to be considered 'mainstream' or is there an expectation for them to fulfil certain labels such a 'gay stand-up' or 'camp TV presenter'? Did you ever fear that you may be pigeon-holed? I've never felt any pressure or expectation to be anyone other than myself. I happen to be a gay woman and my stand up reflects my own personal experience. I think some people may consider being gay to be 'alternative' and maybe it is, I've never had any desire to be mainstream, however comedy can only work if it's a shared experience and my sexuality has never got in the way of telling stories that people can empathise with. "When I started stand up I was advised by a few promoters and agents to play my sexuality down or not mention it at all as it might alienate the audience. I ignored them. " My comedy is almost entirely autobiographical so it didn't make sense to lie about or evade the subject of my sexuality. I have rarely encountered any real homophobia whilst on stage, I'm not saying it has never happened but it's so rare that it's never worried me. Comedy is as meritocratic as it gets. If you're funny the audience will laugh, if you're not they won't. No one cares if you're gay or straight, just be funny. As for being pigeon holed - yes of course I am. Unless you're a white heterosexual man, people will feel the need to highlight your difference, particularly if you work in a very male dominated industry like comedy. That said, I think it's almost impossible to be good at any job without someone pointing out that you're a woman. I've been introduced on stage as a 'female comedian' which always galls me. I'm pretty sure when I walk on stage my gender will be fairly obvious. The worst intro I ever had went like this, "Next up we've got a bird, you might fancy her mate but you can't shag her, I should know I've tried. Don't worry, it's not personal, she's a lezza. 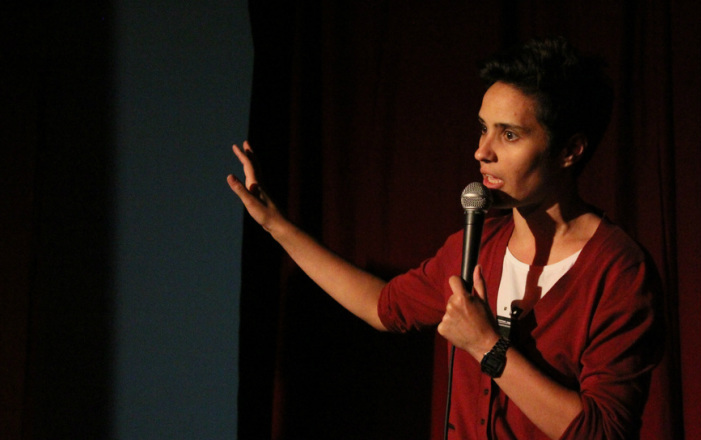 Please welcome Jen Brister!" I nearly punched him in the face. Have you always been comfortable talking about your sexuality in your stand-up? Do you ever alter your material depending on the make up of your audience? I've always been 'out' on stage and I've never had a problem talking about being gay. Of course I alter my material depending on my audience; I have a set piece about drug taking which wouldn't work in front of a middle aged and middle class audience in Surrey. Equally, if I'm doing a gig in front of a group of students I'm not gong to tell jokes about wanting kids or about being nearly 40. But, I made myself a promise when I first came out and that I wouldn't go back into the closet for anyone even on stage and I never have. When did you first think or know that were gay? I think I've always known I was, even when I was a child. There were years of denial, particularly in my adolescence when I had a lot of strong feelings about different girls and no idea what to do about them. I just felt embarrassed and ashamed so I never told anyone. I tried to like boys but that never worked either so I just stayed single and celibate until I left University. I think I must have been the only one of my friends that got no action at all for the entire three years. The irony was of course that everyone knew I was gay, I just couldn't admit it to myself. What was your coming out experience like? I never called myself bisexual again. Who knew it was that simple? I think I've been very lucky because I literally had no negative experiences from anyone I cared about. Most of my friends had been waiting for me to come out for about five years and my family seemed nonplussed by my announcement, particularly my Mum. I use the story in my stand up and I think it's funny because it's true. When I did come out to my Mum all she said was, "You're gay? Thank God, I thought you were going to tell me you were a vegetarian." What advice would you give to anyone who was considering coming out? If you can accept your sexuality then you're over halfway there. If you know you're gay then the next step is to tell someone you trust. It might be a member of your family, but for most people it's a close friend who you know won't judge you. Tell them and see how you feel. I can tell you now that you're not going to feel worse, only better. If that isn't a horrific experience you can think about telling more people in your friendship circle. Honestly, if you feel embarrassed or weird about the attention this might generate, just know this, people will be interested in your coming out story for all of about a week and then they'll have moved on to the next piece of gossip. As for family, that's a tough one. I think you have to know and trust that your siblings and parents love you, if they do struggle with it to begin with, most people eventually come to terms with it. Sometimes you just need to give them a bit of time to process the information. Remember it's taken years for you to come to terms with it, your family may need time too. I would never tell anyone to come out before they're ready, equally I would always encourage someone to get to a place where they can. There is nothing worse than living in the closet, I wouldn't wish that on anyone. Be out and be proud of yourself and seriously, unless it's close family and friends, who gives a flap what anyone else thinks? Since coming out, how has your life changed? Coming out was the best thing I ever did. Before I came out I was pretty miserable. As a kid and teenager I was always very skinny, but in my final year of A levels I started to put on a lot of weight. I didn't realise it at the time but I was quite depressed and I'd comfort eat all the time. I very quickly piled on the pounds and by the time I left for University I was two stone heavier and really unhappy about my body image. I was consumed with internalised homophobia - I hated myself and the way I looked. I couldn't imagine anyone ever being attracted to me and I remember thinking that I would spend my entire life single. At University I suffered with long bouts of depression that led to me sleeping a lot. I can remember being practically narcoleptic at 19 and 20. I would always rather be asleep than engaged with 'real life.' The real problem was that I didn't know anyone else like me. I didn't know any lesbians, there were no gay women in media or television and the few that were 'out' were a lot older than me and I couldn't relate to them. But when Kel helped me to come to out, suddenly the fat young woman hiding behind overly large men’s shirts, listening to Tracy Chapman and eating a lot of bread was gone. I discovered a new me. I’m not going to tell you that I stopped being the cynical old bag I’ve always been or that I lost weight overnight, but I did like myself a lot more and as a result I thought it possible that someone in the near future might like me too. Yeah, it's cheesy but true, deal with it! "The fact is I'm happy to be gay. If there was a pill that could make me straight, I wouldn't take it." Being a lesbian doesn't define me but it's a big part of who I am and I'm very proud to be a big ole lesbo.